There is a variety of feed ingredients used around the globe and, with expert advice, successfully meeting the requirements of PIC pigs. 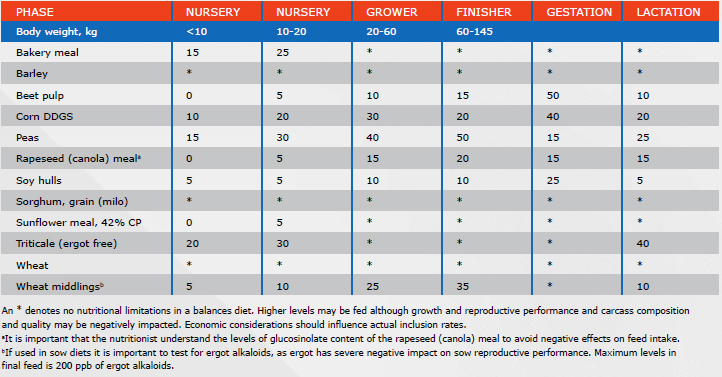 Different feed ingredients can be used up to their upper limit and as long as diets are balanced (Table H1). In certain economic scenarios, it may be more economic going above the upper limits of usage, but this needs to be made with caution, ingredient knowledge, and with expert nutrition advice. Additionally, it is important that nutritionists understand the impact that high-fiber ingredients may have on carcass yield and revenue when included in the diet. Diet cost savings must outweigh the revenue loss associated with marketing a lighter weight carcass. This topic is discussed in more detail in the carcass quality section. TABLE H1. RECOMMENDED UPPER LIMITS OF USAGE (% OF THE DIET) FOR FEED INGREDIENTS IN SWINE DIETS (NATIONAL SWINE NUTRITION GUIDE, 2010). Careful attention must be used when using by-products. By-product ingredients tend to be highly variable in nutrient content and could possibly contain high levels of mycotoxins. Ingredient samples must be taken and analyzed to determine nutrient levels. A robust monitoring system should be in place to ensure consistency and when dealing with alternative ingredients, producers must keep in mind feed mill storage capability, feed flowability, and carcass traits.